Fast travel is available, but the sailing is so fun I rarely used it. 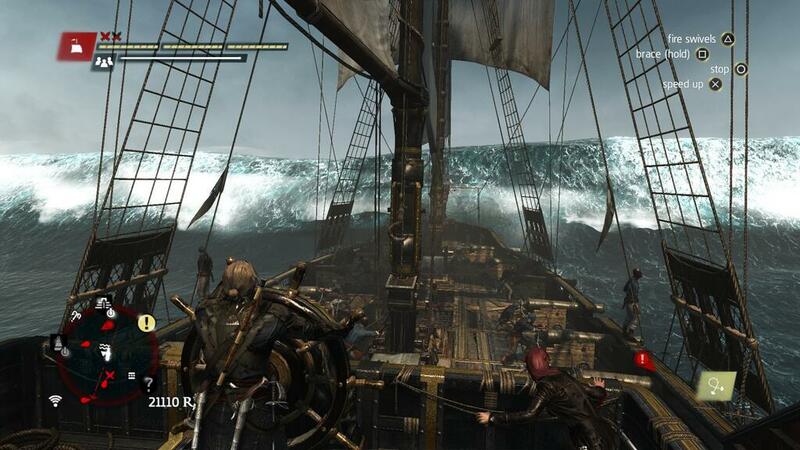 Assassin’s Creed games provide players with a world to explore, and Black Flag‘s world is huge. Sailing Edward’s ship, the Jackdaw, is a joy. Wind direction isn’t as big of a game breaker as it was in Assassin’s Creed III, and you can sail at full speed without worrying about being slowed down by a headwind. The previously mentioned draw distance comes into play here as Edward can see vary far to the horizon. If you can see land, you can probably sail to it and find something there. Also on the horizon are a multitude of ships flying different countries’ colors, and they are ripe for the taking. Bad weather conditions can turn an easy fight into a deadly one. It sounds simple enough, but is complicated by the environment around you. Taking down one higher level ship is hard enough, but if there are other ships flying the same colors nearby you can quickly find yourself overwhelmed. And, as if other enemies joining the fight wasn’t bad enough, mother nature herself can be trouble. Simple waves make aiming cannon fire more difficult, and if a storm kicks up, expect to be dodging waterspouts and rogue waves while trying to survive the fight. It might sound hard, and it is, but a successful attack during a storm is exhilarating. 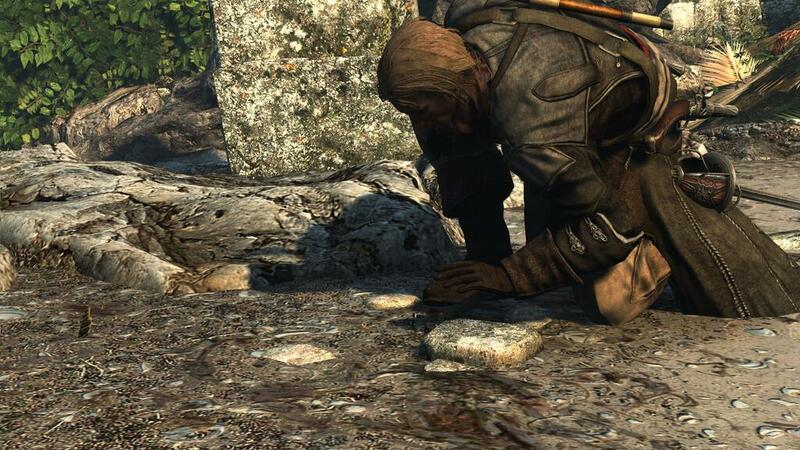 The Assassin’s Creed series is well known for collectibles, and hunting for treasure is fun. 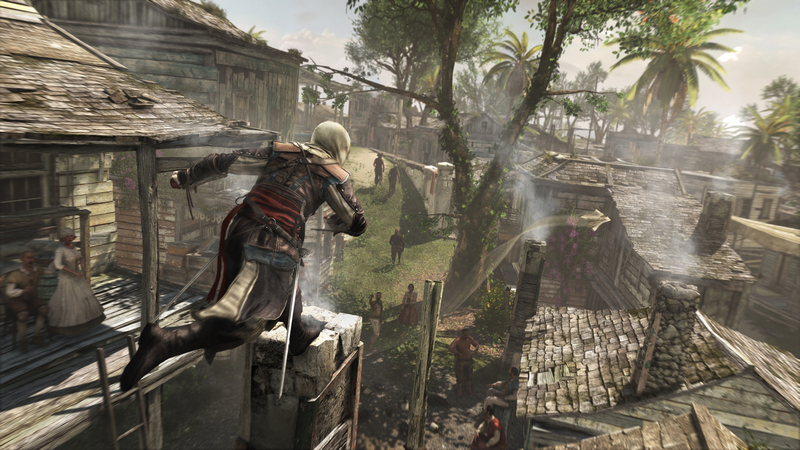 For many players, the Assassin’s Creed series is not just about combat. 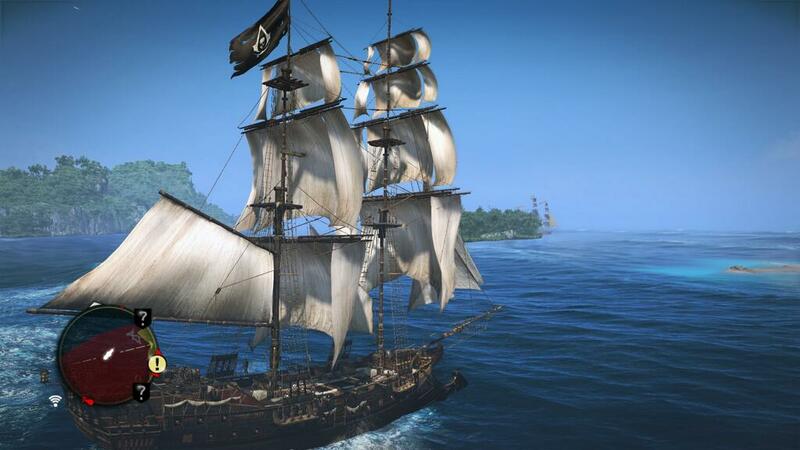 Collectibles and hidden goodies are as much fun as the combat for them, and in this, Black Flag does not disappoint. Climbing a vantage point allows Edward to synchronize like previous games in the series, lighting up all of the surrounding collectibles on your map. Chests are scattered all over the place which help fill your pockets with precious Reales. Animus Fragments challenge you to find creative ways to climb and navigate vertical space. Special gear can be unlocked by finding Mayan stones through puzzle solving. These collectibles are not only in the cities and main on-foot sections, but also on tiny islands dotted all over the Caribbean. Undersea exploration is another neat activity that unfortunately falls apart a bit thanks to the controls – nothing worse than trying to swim rapidly from one air pocket to another trying to explore while a shark is nipping at your heels. At least you can get vengeance on those sharks and whales by harpooning them, earning Edward upgrades like extra pistol holsters, outfits, and armor pieces. Hunting down the sea shanties is a great time, and the rewards are priceless. My favorite collectible by far, however, must be the sea shanties. These pieces of music appear throughout the game and, like the Almanac Pages from Assassin’s Creed III, float away from you when you approach. Part of the challenge of getting them is planning a route ahead of time to catch them. Unlike the pages, however, sea shanties do not unlock trophies, but are instead their own reward. Each one you catch adds a piece of music that your crew sings while on the sea. Picking up a sheet that says “Drunken Sailor” is fun, but if it were something that filled out a menu somewhere or a trophy in your house you never visit, it would just be another checkmark on a list. Picking up “Leave Her, Johnny” and hearing your crew sing the song while cruising across the Atlantic is a whole other level of awesome, and I made it my mission to find every single shanty. Other open world developers take note: this is how you do collectibles. If the absurd amount of content I’ve already detailed wasn’t enough, Black Flag also includes the series hunter/hunted multiplayer. Be stealthy and take out opponents while simultaneously being hunted yourself. There is also a team deathmatch mode that is similar, with bonus points awarded for hiding with your team. Plus, you can modify parameters like scoring bonuses, cooldown timers, and availability of special abilities to create your own mode. The multiplayer is a fun diversion, but it is not the draw of the game. Hopefully the next game in the series can work the excellent ship combat into the multiplayer somehow. After a poor showing with both Assassin’s Creed III and Revelations before it, I was prepared to write the series off. That would have been a mistake, because Assassin’s Creed IV: Black Flag is an absolute blast from beginning to end. I had roughly thirty hours in the single player with plenty of collecting and pirating still to do. Go spend the $60 and play it yourself. I’ll be pouring myself another drink and getting back to pillaging. Those ships aren’t going to empty their holds without my help. Review copy supplied by author. This review based on the PlayStation 4 version of the game.